Home » Fitness » Adult Fitness » How Much Water Do You Need? How long is your workout? If you’re working out longer than 60 minutes at a super intense rate, you may need a low-calorie sports supplement (like Powerade Zero) to replace potassium and sodium lost in sweat (3). If your workout is shorter than 60 minutes, regular water should be sufficient. Where in the world are you getting your fitness on? If you exercise in a hot place with lots of humidity, you’ll need more water than someone exercising indoors with the AC on full blast (3). Working out in extreme heat and humidity increases sweat rate, which in turn increases fluid and electrolyte losses. Are you exercising at a high altitude? If so, add more fluids. Water evaporates faster the higher up you go, making dehydration more likely (3). Yikes! Be sure to pack an extra water bottle if you are planning a hike or long workout at altitude. Do you tend to sweat a lot in general? Some people naturally have a more efficient cooling system than others, meaning they’ll start sweating early on in a workout and therefore have a greater loss of fluids. This is dependent on genetics, as well as the amount of body fat insulating your tissues. If you tend to be a sweaty Betty, you need to replace what you lose with more water than your workout buddy who may hardly sweat at all. The same goes for electrolytes – some people are “salty” sweaters and lose more sodium than others. For those losing a lot of sodium, a beverage with added sodium or refueling with a meal containing salt will help. Just don’t go overboard. Ok, so how exactly do I figure out exactly how much water I need? Weigh yourself right before and after your next sweat sesh. For every pound lost, drink 16-24 ounces(2-3 cups) of replacement fluid (2,3,4). Water should be sufficient but if you are severely dehydrated, a low-calorie electrolyte drink is best to correct electrolyte imbalances. Drink 14-22 ounces (2-4 mL/lb of body weight) of fluid 2-4 hours before exercise to ensure hydration balance before starting and to minimize the amount of water you’re losing during your workout. Maintaining hydration before and during your workout session will help boost your overall endurance. When you’re going extra hard and working out for 60 minutes or more, drink about 3-8 oz. of a carbohydrate-containing electrolyte beverage every 15-20 minutes throughout your workout. There is a good chance your body needs to rehydrate even if you don’t feel the urge to drink. The carbohydrate in the beverage will provide a sustained energy source so you can keep hitting the pavement with the same intensity as the first half of your session (4). A quick way to tell if you’re dehydrated is by the color of your urine (3,4). Next time you go to the bathroom, take a peek at the bowl! If your urine is not pale yellow in appearance, you’re dehydrated and need to drink some more water (2). This is an easy method that you can teach your kids in a snap. If you take a lot of vitamins, this can color your urine so take them a couple hours after your work-outs to better evaluate your urine. 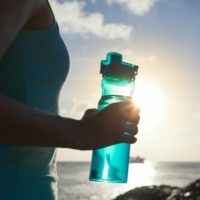 Now that you’re an expert on how to monitor your water intake and knowing when you may benefit from extra fluids, you can use these tips to defend yourself against dehydration and keep your performance at its peak! Krause. Food and the Nutrition Care Process. American College of Sports Medicine. Sawka MN, Burke LM, Eichner ER, Maughan RJ, et al. American College of Sports Medicine position stand: Exercise and fluid replacement. Med Sci Sports Exerc. 2007; 39(2): 377-90. Comment on How Much Water Do You Need?